A custom branded mobile App for your business. We build your business a custom branded App that allows you to build and reward a network of your own loyal customers. A complete end to end mobile platform for any type of business serving a customer base. 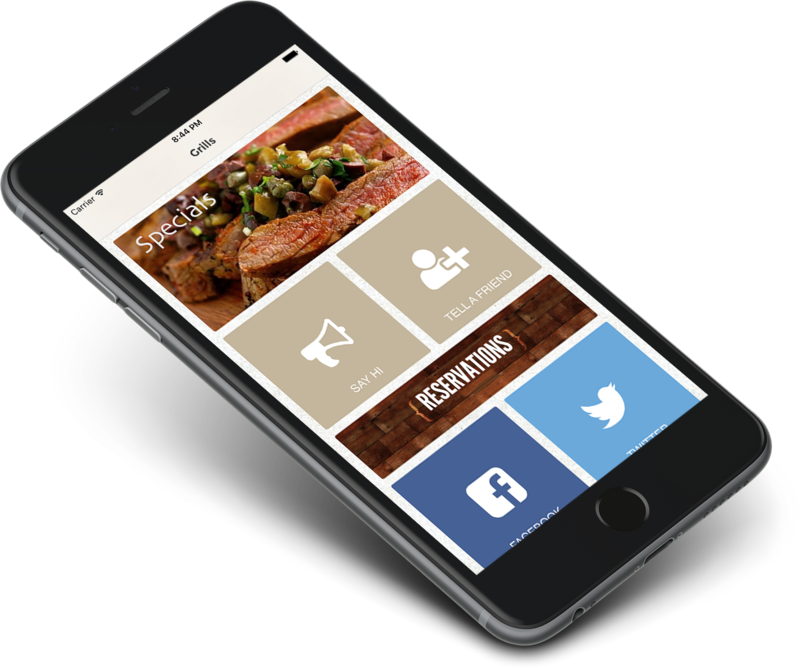 From hospitality to retail, the AppJel platform can be customized specifically for your business, allowing your mobile presence to reach your customers easily and seamlessly. How can an App help your business? Keep your customers engaged the first time they download your App and convert them into long term loyal customers. Unify all your existing disparate services, from online ordering and reservations to menus, specials, social media and beyond. Customers are drawn to businesses with a strong mobile presence. First time online engagements happen on mobile more than any other platform. 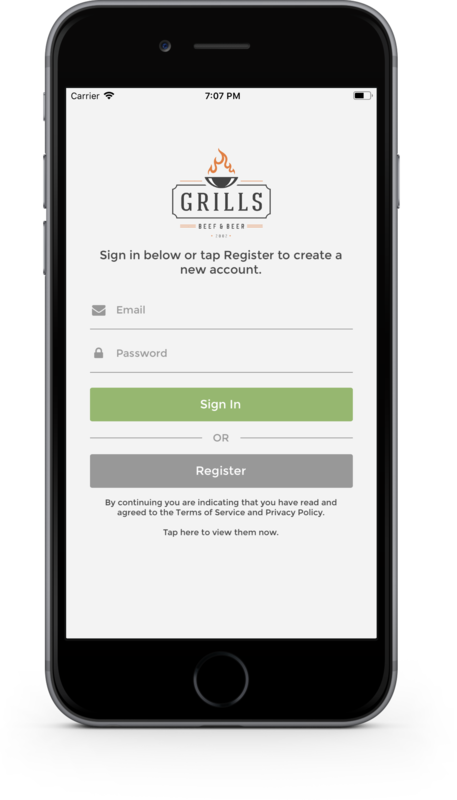 Registering a user profile within your App allows you to build a strong email database and target individual customers for a more personal and meaningful relationship. Easily available for your customers on the Apple App store and Google Play store. Android mobile phones and Android tablets. AppJel Manager gives you full control over all aspects of your App and detailed analytics. A simple punch card model is easily understood by your customers and will keep them coming back. Build a strong email database and target individual customers for a more personal and meaningful relationship. Single tap access unifies all your social media feeds. Further incentivize customers with lifetime rewards that reward long term loyalty. No more hunting for email addresses. One tap allows easy instant feedback from your customers. Easily allow customers to send App store links to their friends and expand your user base. 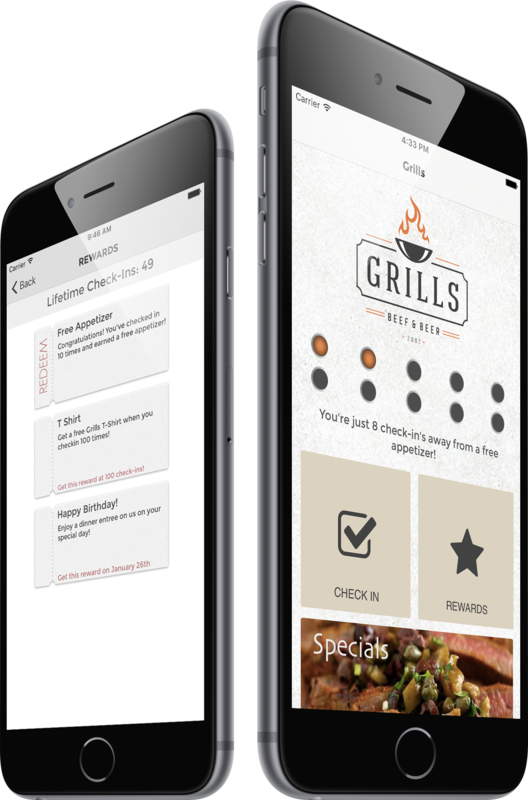 Alert customers to specials and events in an instant without having them open your App. Integrate directly into your already responsive web site to include online ordering, menus, reservations, gift card purchases, shopping carts and more. A single tap brings up your location(s) on a device native map for quick directions. 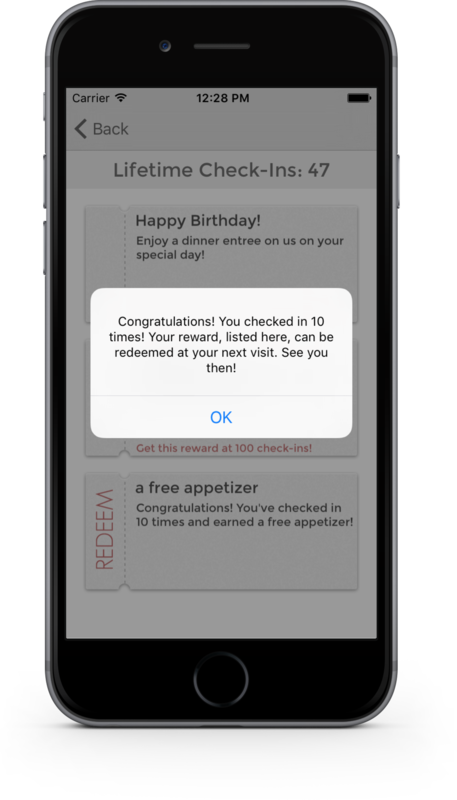 A push notification on their birthday reminds customers that they have a special birthday reward waiting just for them. An easy check-in and redemption process ensures little to no staff training. No more hunting for phone numbers. In app dialing will have customers engaging even more. Looking for custom integration into your existing work flow? We're not just about loyalty. AppJel can accommodate custom features outside of our core offerings. Drop us a note below, we'd love to learn more about your project. 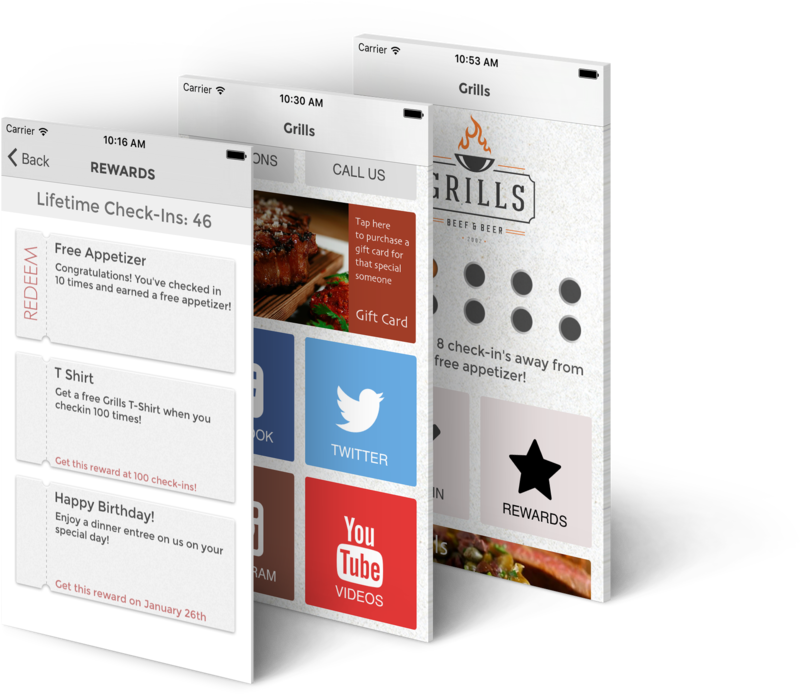 Can your clients benefit from a custom mobile loyalty platform? 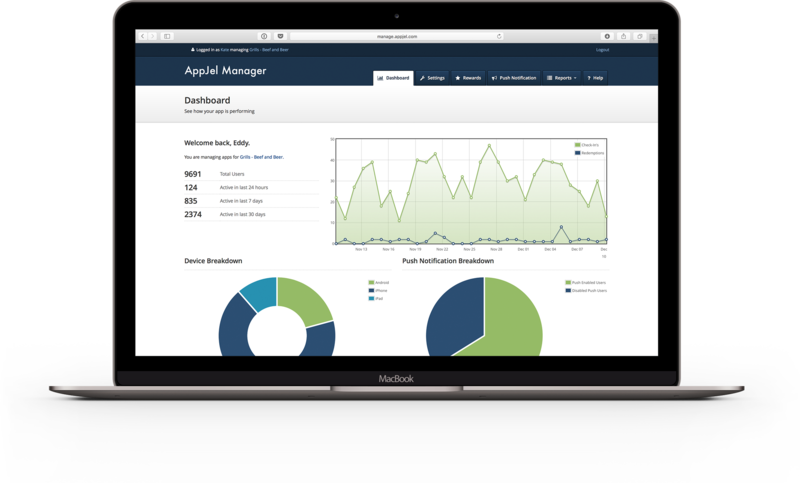 Become an AppJel reseller that includes your own branded AppJel Manager portal. Tell us a little bit about your business and we'll be in touch to build you a custom App. © Copyright 2013 - AppJel Inc.
By using the appjel.com and manage.appjel.com web sites or any Apps published by AppJel, all services of AppJel Inc., you are agreeing to be bound by the following terms and conditions ("Terms of Service"). Violation of any of the terms below will result in the termination of your Account. While AppJel prohibits such conduct and Content on the Service, you understand and agree that AppJel cannot be responsible for the Content posted on the Service and you nonetheless may be exposed to such materials. You agree to use the Service at your own risk. Your login may only be used by one person - a single login shared by multiple people is not permitted. You may create separate logins for as many people as you'd like. You are responsible for maintaining the security of your account and password. AppJel cannot and will not be liable for any loss or damage from your failure to comply with this security obligation. You are responsible for all Content posted and activity that occurs under your account (even when Content is posted by others who have accounts under your account). One person or legal entity may not maintain more than one free account. You are solely responsible for properly canceling your account. You can cancel your account at any time by contacting us at support@appjel.com. All of your Content will be immediately deleted from the Service upon cancellation. This information can not be recovered once your account is cancelled. You can export your account data including user data from the Reports tab in your AppJel Manager account prior to requesting a cancelation. If you cancel the Service before the end of your current paid up month, your cancellation will take effect on the last day of your current pay period. AppJel, in its sole discretion, has the right to suspend or terminate your account and refuse any and all current or future use of the Service, or any other AppJel service, for any reason at any time. Such termination of the Service will result in the deactivation or deletion of your Account or your access to your Account, and the forfeiture and relinquishment of all Content in your Account. AppJel reserves the right to refuse service to anyone for any reason at any time. AppJel reserves the right at any time and from time to time to modify or discontinue, temporarily or permanently, the Service (or any part thereof) with or without notice. Prices of all Services, including but not limited to monthly subscription plan fees to the Service, are subject to change upon 30 days notice from us. Such notice may be provided at any time by posting the changes to the AppJel Site (appjel.com) or the Service itself. AppJel shall not be liable to you or to any third party for any modification, price change, suspension or discontinuance of the Service. AppJel does not pre-screen Content, but AppJel and its designee have the right (but not the obligation) in their sole discretion to refuse or remove any Content that is available via the Service. The look and feel of the Service is copyright © 2013 AppJel Inc. All rights reserved. You may not duplicate, copy, or reuse any portion of the HTML/CSS or visual design elements without express written permission from AppJel. You understand that AppJel uses third party vendors and hosting partners to provide the necessary hardware, software, networking, storage, and related technology required to run the Service. Use of AppJel Manager web site and Apps requires an Internet connection. Your place of business requires a strong cellular signal coverage or WiFi availablity for users of your AppJel App. You must not modify, adapt or hack the Service or modify another website so as to falsely imply that it is associated with the Service, AppJel, or any other AppJel service. You agree not to reproduce, duplicate, copy, sell, resell or exploit any portion of the Service, use of the Service, or access to the Service without the express written permission by AppJel. We may, but have no obligation to, remove Content and Accounts containing Content that we determine in our sole discretion are unlawful, offensive, threatening, libelous, defamatory, pornographic, obscene or otherwise objectionable or violates any party?s intellectual property or these Terms of Service. Verbal, physical, written or other abuse (including threats of abuse or retribution) of any AppJel customer, employee, member, or officer will result in immediate account termination. You must not upload, post, host, or transmit unsolicited email, push notifications, or spam messages. If your bandwidth usage significantly exceeds the average bandwidth usage (as determined solely by AppJel) of other AppJel customers, we reserve the right to immediately disable your account or throttle your service until you can reduce your bandwidth consumption. AppJel does not warrant that (i) the service will meet your specific requirements, (ii) the service will be uninterrupted, timely, secure, or error-free, (iii) the results that may be obtained from the use of the service will be accurate or reliable, (iv) the quality of any products, services, information, or other material purchased or obtained by you through the service will meet your expectations, and (v) any errors in the Service will be corrected. You expressly understand and agree that AppJel shall not be liable for any direct, indirect, incidental, special, consequential or exemplary damages, including but not limited to, damages for loss of profits, goodwill, use, data or other intangible losses (even if AppJel has been advised of the possibility of such damages), resulting from: (i) the use or the inability to use the service; (ii) the cost of procurement of substitute goods and services resulting from any goods, data, information or services purchased or obtained or messages received or transactions entered into through or from the service; (iii) unauthorized access to or alteration of your transmissions or data; (iv) statements or conduct of any third party on the service; (v) or any other matter relating to the service. The failure of AppJel to exercise or enforce any right or provision of the Terms of Service shall not constitute a waiver of such right or provision. The Terms of Service constitutes the entire agreement between you and AppJel and govern your use of the Service, superceding any prior agreements between you and AppJel (including, but not limited to, any prior versions of the Terms of Service). Questions about the Terms of Service should be sent to support@appjel.com.